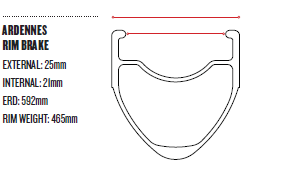 Ardennes LT Plus Rim Brake - HED CYCLING PRODUCTS INC.
What is Ardennes Plus? In a few words, it’s our award-winning Ardennes… plus some awesome. The Ardennes Plus takes what the original Ardennes did – and does it better. Rim width grew from 23mm to 25mm. A new rim extrusion means that the wheels are still incredibly light. Lateral stiffness has gone up, while the smooth ride quality got an extra layer of buttery smoothness. Ardennes Plus is offered in several versions. Ardennes Black is the top-of-the-line with outstanding Turbine Braking Technology and all-black appearance. SL swaps out for CNC machined braking surfaces, but keeps the high-end spokes, bearings, and overall construction. LT has slightly heavier hub shells and spokes than SL, but with all of the quality you expect from Hed. CL is the burly-and-classic do-it-all version, with traditional flange hubs and lacing to tackle your next gravel race or cobblestone-laden road. All are compatible with tubeless or tube-type tires, and can be built with a Powertap rear hub for those that wish. Ardennes Plus – for when you want a wheel to get the job done, no questions asked.